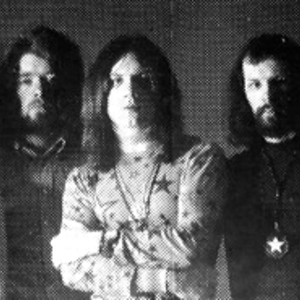 Leaf Hound formed in 1969 under their original name, Black Cat Bones. Early incarnations of the Black Cat Bones featured guitarist Paul Kossoff and drummer Simon Kirke who both left to form Free. Black Cat Bones issued one album for Decca Records entitled Barbed Wire Sandwich. They replaced their vocalist shortly after releasing the album, adding Peter French to the line-up. Guitarist Rod Price departed soon after to join Foghat and French added his cousin Mick Halls on guitar. Soon after Black Cat Bones changed their name to Leaf Hound. At this point the band consisted of French on vocals, Halls on guitar, the Brooks brothers, Derek and Stuart, on guitar and bass respecitively, and Keith George-Young on drums. Growers of Mushroom was recorded at Spot Studios in Mayfair, London in late 1970. Shortly after the Brooks brothers departed and Ron Thomas filled in on bass. The band toured Europe as a four piece and released the "Drowned My Life in Fear" single and the Leaf Hound album in Germany on Telefunken. The Growers of Mushroom album was released shortly after (featuring all of the tracks on the self-titled album) but by this time French had already departed to join Atomic Rooster for their album In Hearing Of. French would also later join American hard rock band Cactus. Growers of Mushroom became a collectors item in the years to come and was voted the number one most collectable rock album in Q magazine. It was released on CD in Germany by Walhalla Records with one bonus track, "It's Gonna Get Better" (b-side to the "Drowned My Life in Fear" single). It was re-released by See For Miles Records in 1994 with two bonus tracks, "It's Gonna Get Better" and "Hipshaker". Akarma Records re-released the vinyl version in 2003 featuring one bonus track, "It's Gonna Get Better." It was re-released on CD a third time in 2005 by Repertoire Records featuring the two bonus tracks on the See For Miles release as well as a third bonus track, "Too Many Rock 'n' Roll Times."